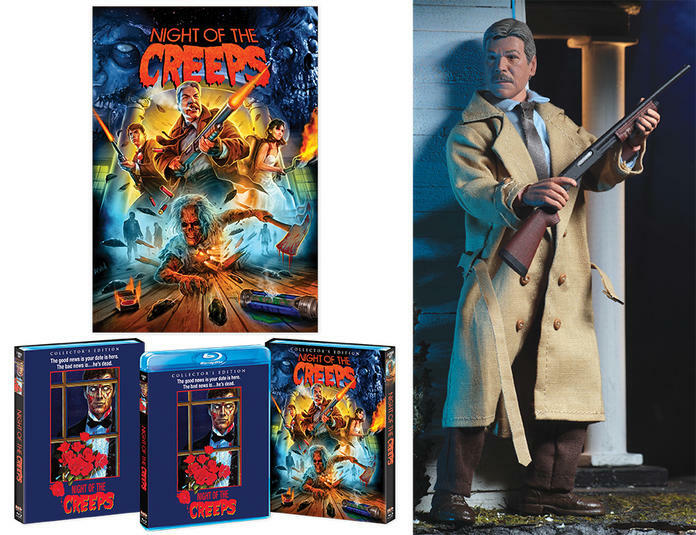 A new release is coming from Scream Factory, photo via the Dawn of the Discs, for a Blu-Ray release of the cult classic horror film Night of the Creeps was revealed. 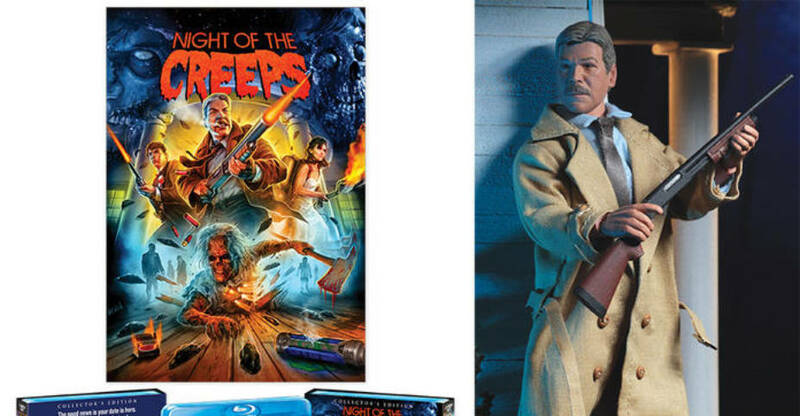 This release is going to be another joint venture between Scream Factory and NECA, as the Deluxe or Special Edition will include a Detective Ray Cameron (Tom Atkins) 8″ Scale Clothed Figure. The figure includes a trench coat and a shot gun. An official announcement is rumored to go live today. We’ll update with official details, pricing and more once the details are posted. Click the banner image for the full photo. Thanks for the heads up! Looks like the original reveal came via Dawn of the Discs. Their mego line is amazing.....and this is further proof. Very cool..plus he's it looks like it'd be easy enough for Neca to release a Halloween 3 figure later on Love the new artwork too, is that going to be the artwork for the figure/bluray combo or just a variant slipcover for the bluray? Don't know yet. The only info available is the image itself. OMFG...my life is complete. A Tom Atkins figure!! I'm totally getting this. Seriously, Tom Atkins is awesome. In addition to all his John Carpenter and other assorted horror flicks (Halloween 3 is the most underrated movie ever), I was recently re-watching watching HBO's Oz and was shocked to discover that he guest-starred on two episodes. I had totally forgotten he was on there. $70 for the set? Ugh. Night of the Creeps ain't THAT good of a movie. What are the chances that NECA will do a stand-alone release of the Tom Atkins figure down the line? I know they've done that with other figures they've done for video releases, but I don't know how big a seller this figure would be. Is it possible? There was a limited run of Mego style Dr.Challis figures made by some company that was pretty expensive, so if you absolutely need a Tom Atkins figure in your life, maybe $70 isn't too bad lol. I have a feeling Neca is going to repurpose this tho. Dont they still have the license for The Fog? Wow, I had no idea. I Googled some pics of the figure and it doesn't look half as good as NECA's in terms of likeness. I guess I'll just buy the Creeps set and maybe sell the blu-ray on ebay or something. I guess I'll just buy the Creeps set and maybe sell the blu-ray on ebay or something.